Our Fishing Regulations contains rules, limits and other information. If you plan to fish in Georgia, start here! Georgia law requires anglers age 16 and older to have a current Georgia fishing license in their possession while fishing in fresh or salt water in Georgia. Licenses may be purchased online, in person at participating locations, or by phone. Your purchase supports the conservation of Georgia's aquatic resources. Each week, the Georgia Wildlife Resources Division blog brings tips and news straight from our fisheries staff. Trout fishing regulations, locations, stocking information and more. Information about the walleye stocking program, guides for fishing walleye and more. This cooperative program between Georgia State Parks & Historic Sites and WRD helps equip 25 state parks with fishing poles and stocked tackle boxes that visitors can borrow for free! Revised each year, these are some of the best fishing info from fisheries biologists and technicians about rivers and lakes in Georgia. 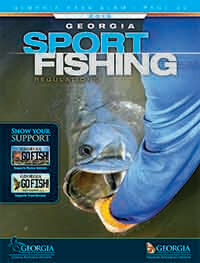 Fish species, best time of year to fish, tackle suggestions and more. PFAs are managed for fishing. At them, you can fish from the bank or a boat, picnic, hike, watch wildlife and enjoy the outdoors. Good bank fishing opportunities are available at all PFAs and many of them have special kids fishing areas for young anglers. Unless otherwise posted, fishing is allowed on WMAs according to statewide regulations. Georgia's state parks are great places to fish for seasoned anglers or beginners alike. Many parks loan out fishing rods and tackle boxes for those new to the sport. Reward program for anglers that catch 5 of 10 eligible black bass species in a calendar year. This program rewards anglers that catch a fish that meets or beats a specific weight or length for the specific species. Catching a state record fish is an angler's dream—check out current state records and find out what to do if you catch one. Children, ages 8–15, and their supervisors are invited to a weekend of learning about fishing through our Fish-n-Learn Education Program. Tips for fishing with kids, suggested places to go and more. Remember your child's first fish with a fun printable certificate. Need to know what you have caught? Check out this helpful information about Georgia game fish and where they are found. Georgia residents don't need a fishing license on these 3 free fishing days each year. Planning on hosting a fishing tournament or want to see tournament data?